So far I’ve given you Holiday Gift Ideas for the man in your life and for the hostess. 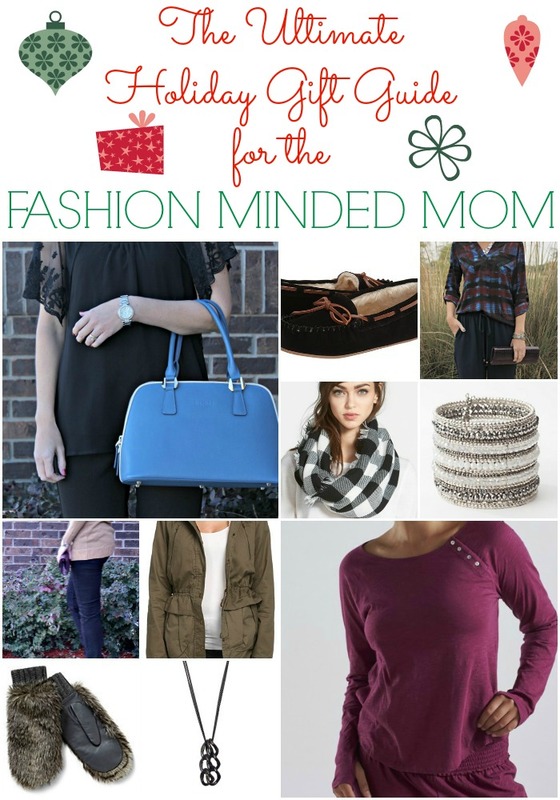 Today I’m focusing on the fashion minded mom and do I ever have some fantastic gift ideas to share with you! From cozy sweaters and boots, to gorgeous jewelry and handbags. Whether you’re buying a gift for a special lady in your life or you need to drop your significant other some gift hints, I think you’ll find something every fashion minded mom would love to receive. 1. SUSU Handbag – How am I liking my SUSU handbag? I love it. The blue color goes with more than you might expect and if you haven’t checked out their collection, you should. Plus, enter the giveaway until December 31st and you just might win one! 2. Tundra Boots – These are very comfortable slipper like shoes that can also be worn outside. I have a similar pair and love them. The faux fur lining makes slipping into them in the morning worth getting ouT of bed for. 3. Metaphor Jogger Pants – I am still loving my jogger pants by Metaphor. They are extremely comfortable, flattering and easily dressed up or down. I wore them the other day with a casual sweater around the house and then changed into a dressier top and booties before I left the house. They’re so versatile and something a little different for your wardrobe. 4. Buffalo Plaid Infinity Scarf – This plaid scarf by Steve Madden goes with almost any look. It has a fringed edge and comes in several different color combinations. The buffalo plaid pattern is a classic and well-loved by many. 5. Natural Sparkle Cuff – I can’t wait to show you this cuff by J.Jill styled. It’s created with Czech crystals and plated brass beads that give it a gorgeous sparkle, perfect for any Holiday outfit. It’ll add a touch of shimmer to your winter ensembles and will become a treasured piece of jewelry in your collection. 6. Lee Jeans – I’ve been enjoying my new pieces from Lee jeans. I find more and more ways to style my gray jeans every week, and my black Easy Fit jeans have become a go-to item in my closet. I also can’t wait to show you one of their denim jackets that I always receive compliments on when I wear it. 7. Military Style Jacket – I am still on the hunt for a good olive green military style jacket and this one from Double Zero might just be it. I love the faux fur hood and zip out vest feature. It also has the peplum waist you can cinch up so your waist doesn’t get lost. 8. Faux Fur Mittens – These faux fur mittens from C Wonder will keep you warm and fashionable. They’re lined with cashmere and finished with a genuine leather palm, which makes gripping a to-go coffee much easier. I love the gray color, but they also come in black. 9. Kerry Necklace – I love jewelry that is versatile and this Kerry Necklace from Of Mercer just might surprise you with its functionality. It can be worn seven different ways, including the ability to change the length. It’s their version of SGB Designs’ Signature Spy Necklace. 10. Organic Loungewear – Coyuchi’s new organic loungewear is designed for relaxing, which is what moms need during the busy Holiday season and thereafter. Moms can also rest easy knowing that the fabric they’re sleeping in is as pure as it is comfortable. The collection includes sleepwear classics and mix-and-match separates with modern silhouettes. 11. 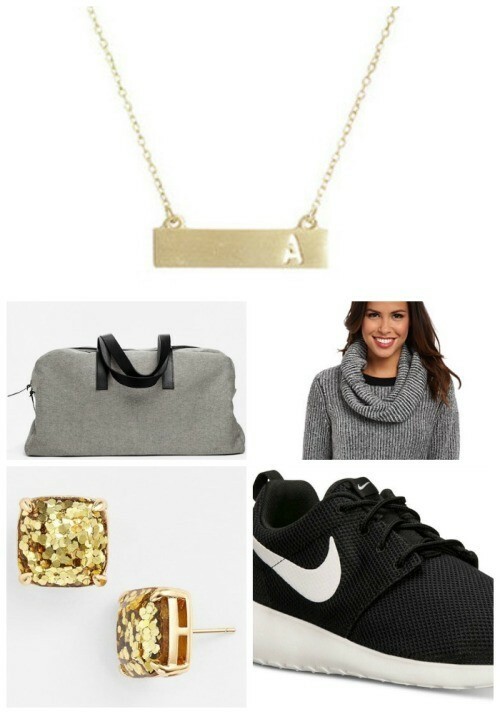 Bar Letter Necklace – There’s something so perfect about this Bar Letter Necklace from Cents of Style. You can give it to the woman who wears minimal jewelry or to the one who loves to layer several different necklaces. It just works for everyone and it’s a gift with a personal touch. 12. The Twill Weekender – With its 100% cotton twill exterior, leather strap and black racing stripe, this Twill Weekender bag is a classic. She’ll look fashionable, but not like she’s trying too hard, on her weekends away. 13. Marled Sweater with Snood – Cool-weather cozy meets city chic in this Kenneth Cole New York sweater. Marled knit lends depth to the chunky, textured knit. The oversized cowl neck converts into a snood to cover your head on chilly days. 14. Glitter Stud Earrings – These Kate Spade New York Boxed Glitter Stud Earrings are perfect for the lady who likes a little bit of glam. They are party perfect with the sparkly glitter that shines through the clear stone. 15. Nike Sneakers – Is getting fit on her goals for 2015? If so, these Nike sneakers were designed to be as simple as possible, giving you only what you need and none of what you don’t. The Women’s Nike Roshe Run Casual Sneakers are versatile enough to be worn on your next run and as your favorite everyday casual kicks.